When the dust settles, E3 can leave behind a real mess of news and trailers for anyone who wants to try and see everything that was shown off at the conferences but didn’t have the time to tune in on the night. From the “always online” gameplay of Fallout 76 to the futuristic car chases of Cyberpunk 2077, there’s a lot to catch up on. You can always watch recordings of the conferences in your own time, but do you really want to sit through the awkward banter of presenters, the on-stage interviews with community members and sports players you don’t recognise, and game demos that crash part way through? Of course not, you want to get straight to the juicy bits – the trailers. For a comprehensive rundown of everything that happened at the conference this year, we’ve put together an E3 2018 hub. For all the trailers released over the week, then, look no further. Below you’ll find every trailer, ordered alphabetically and by conference. That’s just how much we care. With all the E3 2018 conferences finished, we have all the E3 trailers you need in one place – just jump to the footage you want to see by clicking the list of the major conferences below. 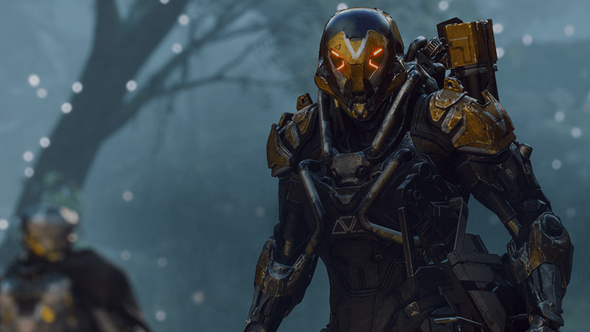 Check out our guide for everything there is to know about Anthem’s release date, story, Javelins, and enemies. Check out our guide for everything there is to know about Battlefield V’s release date, campaign, modes, and classes. Find out about the Halo Infinite release date and all the latest gameplay details. Check out all the latest details on the Sekiro: Shadows Die Twice release date. For more on the post-apocalyptic shooter, here’s what we know about the Metro Exodus release date. Plunder the seven seas with our Sea of Thieves tips. Here’s everything we know about PUBG’s new maps. Here are all the latest details on The Division 2 release date. For more zombie parkour news, here is everything we know about the Dying Light 2 release date. Find out all we know about the Just Cause 4 release date and the latest gameplay news. For more on the upcoming shooter, here are all the latest Gears of War 5 release date and gameplay details. Here’s everything we know about the Cyberpunk 2077 release date and the latest gameplay and story details. For more on the even angrier sequel, here are all the details on the Rage 2 release date. For more on the demonic shooter, check out what we know about the Doom Eternal release date. For more on the multiplayer RPG, here are all the latest details on the Fallout 76 release date. Learn more about the next Bethesda RPG with all we know about The Elder Scrolls 6 release date. For more, check out all the latest Just Cause 4 release date and gameplay details. For more on the Destiny rival, here’s everything we know about The Division 2 release date. For more, check out everything we know about the Skull and Bones release date, ye mangy cur. For more from the stealthy stabby series, here is our lowdown on the Assassin’s Creed Odyssey release date. For more Agent 47 action, check out our breakdown of the Hitman 2 release date with the latest gameplay details. We got check out the Resident Evil 2 remake gameplay over at E3. For more on the shooter expansion, check out everything we know about the Destiny 2: Forsaken release date. Phew, that’s a lot of trailers. There you have it, all the E3 2018 trailers in one handy place. It has been an excellent show for PC gamers, and we’re itching to see more from loads of the games shown off during the event.